Harry Lumley, already fluey, chases hard after this fella because there’s no-one else. And when fluey Harry Lumley falls — because, of course, he’s in his goalie gear — we have to laugh. I make it sound like I was there, which I wasn’t. This is a charity game, in January of 1950, the first-place Detroit Red Wings are taking on a team of International League all-stars to raise money for the lesser league’s fund for injured players, which is kind of ironic, as we all make sure to say at the time. A comedy game the papers call it. Old Apple Cheeks, as we call Lumley, AC for short, old AC will sometimes take a regular stick and move up out of his net for face-offs down at the far end, which he does in this case we’re talking about here, he’s up when the puck gets by him, and so he has chase because the net is empty. Go AC, we call, ha, ha, watch out — oh, no, Harry. Well, the puck got past me and I ended up trying to chase this fella who was about to shoot into the open net. I tripped and fell and sprained my ankle. It was a bad sprain, too! Actually, he got up and played on. Later in the game he was off again down the ice, trying to score. He was in on the All-Stars’ net, about to shoot when he, fffump, fell down. The trainers helped him to the dressing room. From there he went to Detroit’s Harper Hospital. The x-rays showed no fracture, just the sprain. This was the Thursday. Did I mention the Red Wings won the comedy game? 17-10. Sunday they had Boston coming in. When Lumley couldn’t play, the Wings called up young Terry Sawchuk, who’d been starring in Indianapolis for the AHL Capitals. Sawchuk, who’d already been up before, in December, when Lumley’s flu was bad, was 20. Old Apple Cheeks, I said, but Lumley was only 23. Anyway, the Boston game. 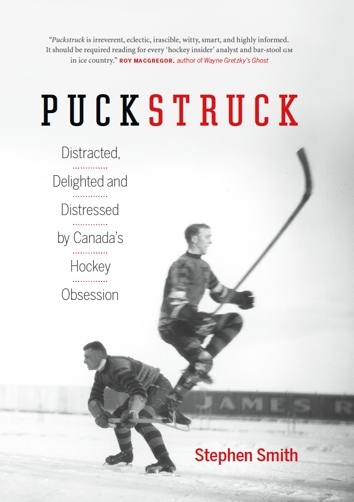 The Sawchuk biographies, of which there are two, both frame the scene from the dressing room, before the game where Sawchuk struggles into Lumley’s number 1 sweater. Detroit manager Jack Adams wasn’t far behind in his thinking. Harry Lumley claimed his sweater back to finish the season and was in the Detroit net that April when the Red Wings beat the Rangers to win the Stanley Cup. By mid-July, he was gone to last-place Chicago as part of a nine-player deal that cleared the crease for Sawchuk. In David Dupuis’ Sawchuk, Lumley recalled hearing the news while he was driving from Owen Sound, Ontario to a softball game in Goderich. I was coming to a washout in the road and was about to slow down for it, when all of a sudden, at that precise moment, I hear on the car radio that I’ve been traded to Chicago. It was such a shock that, instead of braking, my foot hit the gas pedal! I hit the washout at full speed and put the fan through the radiator! I did not have a clue that the trade was coming. I mean, after all, we had just won the Stanley cup. Plus it was upsetting to go from a first-place club to a last-place club. I called Jack Stewart who was going with me and we had quite a talk. I hated every minute in Chicago. I would have sooner gone to fight in the Korean War! In the season that followed. Chicago finished at the bottom of the standings again, while Detroit held on to first. They lost in the playoffs to Montreal, who duly fell to Toronto in the finals. Sawchuk won the Calder Trophy as rookie of the year. 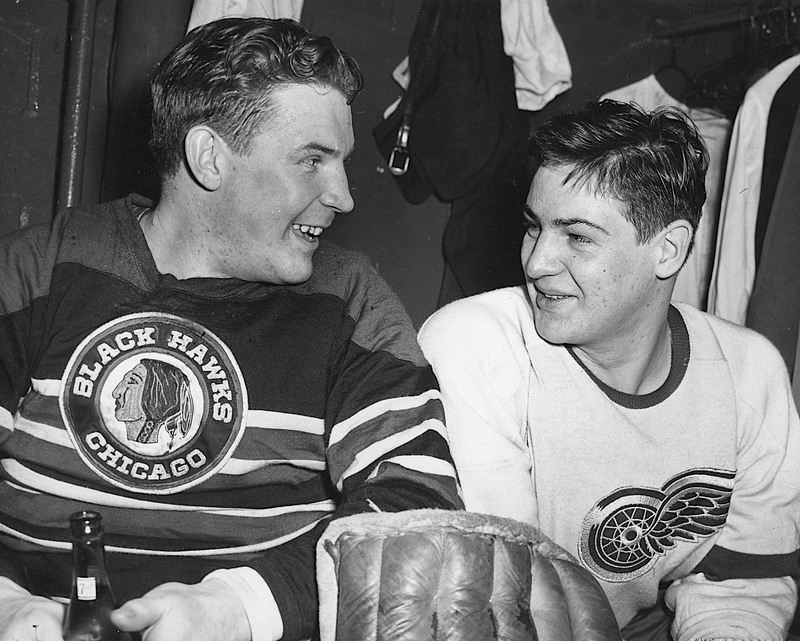 Above, the two former teammates share smiles the season after that, 1951-52, when Detroit regained the Stanley Cup, with Sawchuk winning the Vezina Trophy. Chicago? Last again.